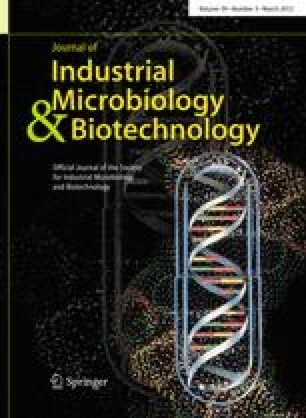 Sugar maple hemicellulosic hydrolysate containing 71.9 g/l of xylose was used as an inexpensive feedstock to produce polyhydroxyalkanoates (PHAs) by Burkholderia cepacia ATCC 17759. Several inhibitory compounds present in wood hydrolysate were analyzed for effects on cell growth and PHA production with strong inhibition observed at concentrations of 1 g/l furfural, 2 g/l vanillin, 7 g/l levulinic acid, and 1 M acetic acid. Gradual catabolism of lower concentrations of these inhibitors was observed in this study. To increase the fermentability of wood hydrolysate, several detoxification methods were tested. Overliming combined with low-temperature sterilization resulted in the highest removal of total inhibitory phenolics (65%). A fed-batch fermentation exhibited maximum PHA production after 96 h (8.72 g PHA/L broth and 51.4% of dry cell weight). Compositional analysis by NMR and physical–chemical characterization showed that PHA produced from wood hydrolysate was composed of polyhydroxybutyrate (PHB) with a molecular mass (M N) of 450.8 kDa, a melting temperature (T m) of 174.4°C, a glass transition temperature (T g) of 7.31°C, and a decomposition temperature (T decomp) of 268.6°C. The authors express sincere thanks to Dr. Thomas Amidon and Dr. Shijie Liu for the supply of wood hydrolysate and Mr. David Kiemle for technical assistance with NMR spectra and GC-MS analysis. This research was supported by a grant from the New York State Energy Research and Development Authority (NYSERDA).